Brighten your day with this delicious and healthy Pineapple Orange Smoothie recipe, great for breakfast or anytime! Place the pineapple chunks, vanilla extract, Greek yogurt, and orange juice in a blender. 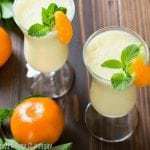 Serve garnished with orange segments and fresh mint (optional).